Guns N’ Roses have announced dates for an Australian tour in early 2017. 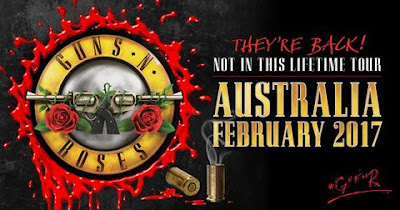 The reunited trio of Axl Rose, Slash and Duff McKagan will bring the Not In This Lifetime show down under for five stadium concerts starting February 7 in Brisbane. The lineup – which also includes guitarist Richard Fortus, keyboardists Dizzy Reed and Melissa Reese, and drummer Frank Ferrer – will also perform in Sydney, Melbourne, Adelaide and Perth. A Guns N’ Roses Nightrain presale begins Friday, August 19 and a Telstra Thanks presale for Telstra customers starts Tuesday, August 23, while general public tickets and VIP Packages will go on sale to the general public on Friday, August 26. Guns N’ Roses’ summer run across North America is winding down with three shows remaining, including a pair of dates at Dodger Stadium in Los Angeles, CA on August 18 and 19 before the finale at Qualcomm Stadium in San Diego, CA on August 22. The band will then play 10 shows as part of a South American tour that begins October 27 in Lima, Peru.